Now it is your turn to doodle! So the next time you are in a meeting, at a conference or presentation, on the phone or in the train - take your sketchbook, take a pencil and just start drawing and see where your pen takes you. No idea what to draw? Start with the first word you hear, the first object you see when you look up from your sketchbook, the first thing that comes to your mind. Here are some videos that show you how easy it is! It is not about drawing perfectly, but about training your hand-mind connection. 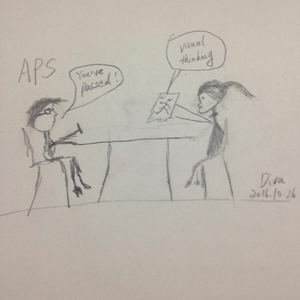 I hope with the skills of visual thinking, I can pass through the APS examination soon. I really like your drawing! 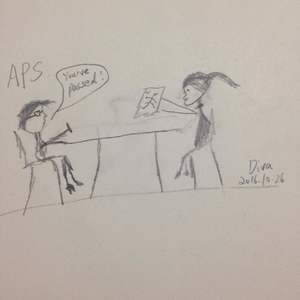 Can you tell me what the APS test is? Thanks for your praise. I'm a Chinese and I have worked for 9 years as a TV director. I'm applying further education in Germany University. APS is an test which host by German Embassy. It check the candidate's knowledge which learnt in college. It's a necessity to pass through the test for enrolling German University and visa.Many Chinese candidates lost the chance to have education in Germany because of failure in APS. I majored at applied physics. I am in a full time job and struggling to review the lessons which I took 10 years ago. You can imagine how stressful I am feeling now. I hope the visual thinking could help me to review and presentation for the test. I have improved my picture, maybe it makes sense more. Looking forward to pursuing my dream in the future.